Thanks for looking at our NEW 2017 Haulmark 28ft Jobsite trailer! This trailer is the ultimate jobsite combo trailer! 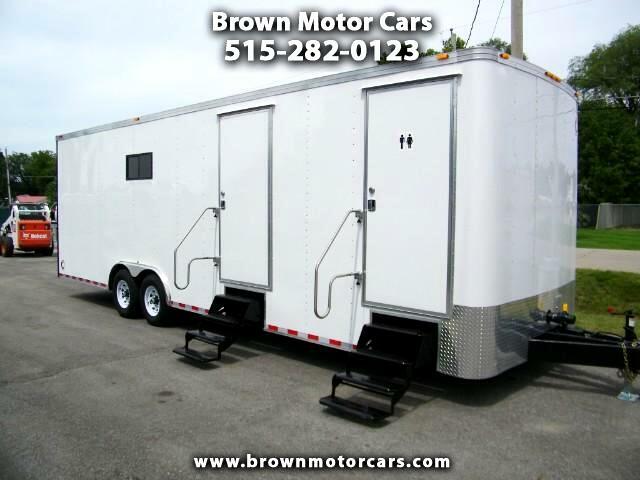 The trailer is 28ft long total and has a 14ft garage/workshop area and than is also equipped with a office area and than 2 bathrooms. One bathroom is attached to the office and than the other has its own access. This trailer also has A/C and heat. The A/C is vented in the office and bathrooms! The interior height of the garage is 8 1/2 ft and than 7ft in the office and bathrooms! It is equipped with 6,000lb axles with brakes on both axles. The garage area is equipped with a roll up style door so you don't have to worry about dropping down a ramp door or latching cargo style doors! Give us a call with any questions but don't wait because this one won't last long!